The following is a guest article from Clare Witts, ITG’s Head of Commission Management Services, Asia Pacific. The recent decision by the Commonwealth Bank of Australia to close its institutional equities business is reflective of some of the changes in the Australian market. I recently spent a week in Australia meeting with fund managers of all sizes, asset consultants, research providers and industry groups. The meetings were to discuss the topics of unbundling of dealing commissions, commission sharing arrangements (CSAs) , and how to value investment research. Global asset managers with Australian onshore presence are already prepared for changes to UK and European regulation which will force a budgeting process and clear valuation of research. Obligations to treat all clients fairly, and a desire to minimize operational complexity, are driving these firms to introduce global processes which separate research payments from trading volumes and put a value on research. Most expect and hope the CSA model to remain as the mechanism to pay for research. A number of the largest managers of Australian assets already run CSA programs to manage broker lists and pay for independent research. They are able to report to investors about how their commissions have been used, and are emphasizing their best practice approach to investors. Several large Australian asset managers already run clear budgeting and research valuation/vote processes and reported that this helps in managing their broker relationships and controlling costs. Smaller managers reported that they are receiving more questions from investors and potential investors about reporting on what commissions are used for. They are therefore needing to change their processes accordingly. Australian asset managers with more than 2 or 3 CSA brokers are turning to CSA Aggregation services to reduce the administrative burden. While there are few independent industry metrics clearly tracking increased CSA adoption in Australia, anecdotally global growth trends seem to be reflected – and in quantitative terms the number of Australia-based clients using ITG for CSA services has increased by 80% over the last three years. Interest from Super funds and asset owners in the topic of dealing commissions is high. The Australian market has a strong focus on good corporate governance and transparency for investors within the asset management process. For Super funds managing assets themselves, being at the forefront of global best practice has value. In other areas, asset consultants reported seeing an increase in managers requesting permission from asset owners to put CSA programs in place, and a higher number of requests from investors to receive reporting about what commissions are used to buy. Fund level commission reporting is becoming a far more common request from investors to their mangers. There has been a surge in the number of successful Australian independent research providers (IRPs) over the past two years, with many Australian portfolio managers increasingly receptive to using non-bank research. Key Australia-based IRPs include Diogenes Research, Hunter Green, Endeavour Equities, QMG, Minack Advisors, Corporate Endurance and Precept with newer entrants Evidente, Clinton Capital and Long Lake Research also making good headway. This is in conjunction with more payments being made via CSA to smaller and mid-sized Australian brokers over the same period, as fund managers rationalize their broker lists to those with a focus on demonstrable best execution. 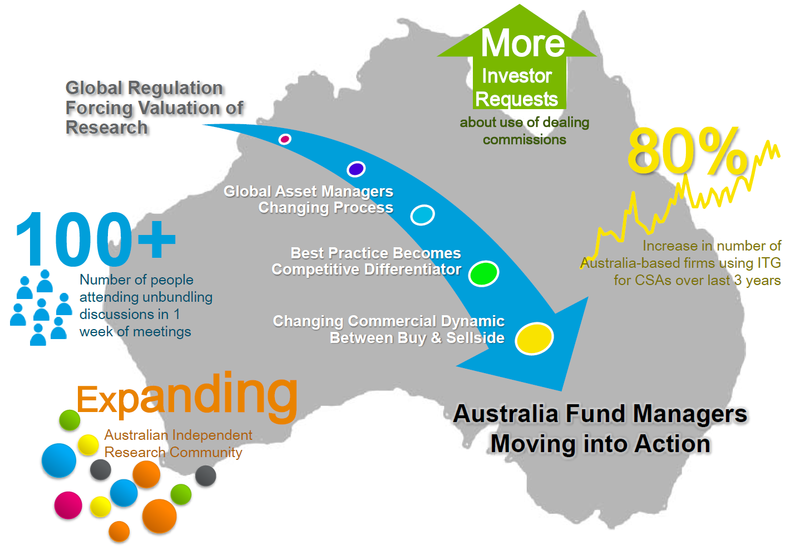 In the past 12 months ITG has made CSA payments to over 20 Australia-centric brokers for research provided to Australian fund managers. Anecdotal feedback from my conversations in Australia is that overall confidence in differentiated bank/ broker research is lower than ever – the recent announcement by Commonwealth Bank of Australia to close its institutional equities team is reflective of some of the challenges faced in monetising and scaling equity research offerings in today’s Australian market. As regulators globally focus on conflicts of interest within the bank/ broker model, there may be further changes within the Australian market. Clare Witts is Director, Head of Commission Management and Marketing, ITG Asia Pacific. She is responsible for the strategy and implementation of ITG's interaction with institutional clients, regulators, exchanges and the media across the Asia Pacific region. She also runs ITG's Commission Management and CSA program in Asia and Australia. Since moving to Asia nine years ago, Clare has also been actively involved in a number of industry groups including the FIX trading community and ASIFMA, and she has chaired the ASIFMA CSA group coordinating industry feedback on the topic of regulation of dealing commissions.